Decontamination and sanitization is a crucial component to assist in resolving your nuisance bird issue. 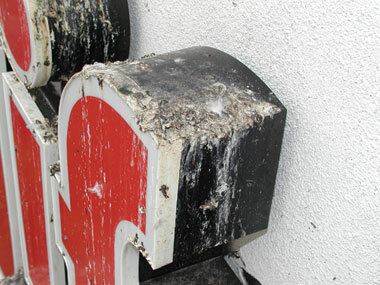 Bird excretions and nesting materials are dangerous because of the diseases they carry. In addition, any remnants of an animal could attract other animals. Bird Busters® understands the importance of cleaning a site properly and has designed a comprehensive 4-step decontamination process that ensures that nothing is left behind. 1. Moisten and loosen the debris. Dried bird droppings will become airborne when disturbed (cleaned). Airborne droppings can carry disease and create a significant disease risk to employees and customers. It is important that they are wet down to eliminate this risk. Wetting with a bactericide will kill the bacteria at the same time. 2. Remove of bird waste and nesting materials. It is unlikely that large volumes of waste can simply be washed away; they need to be scooped up and removed in bags and disposed of properly. Bird Busters® works with all local municipalities to ensure that all waste is disposed of properly. 3. Wash. Once the majority of the waste is removed, the building surface can be washed with water, detergent and scrub brushes or pressure washed. 4. Sanitize. Once all of the waste is removed and the building has been cleaned, Bird Busters® then applies a bactericide that will sanitize the surfaces and leave a clean smell.